Kunichika depicts the famous scene Yoshinogawa from the third act of the drama Imoseyama Onna Teikin, performed at the Shitomi-za in October 1883. In this scene the young samurai Koganosuke and the beautiful Hinadori decide that they would rather commit suicide than be separated. They exchange glances from their separate verandas on opposite sides of the Yoshino River as Hinadori's widowed mother Dazai Kōshitsu Sadaka and Koganosuke's father Daihanji Kyozumi hold sprigs of cherry blossoms, symbols of their intentions. For another print related to this October performance of the play see IHL Cat. #1001. The below print, picturing the same scene from the play, was created by Kunichika for an 1899 performance at the Kabuki-za theater. Over-the-top stage performances have captivated audiences of kabuki since its inception in the early 1600s - but the role of immortalizing those theatrical moments has long been played by woodblock prints. 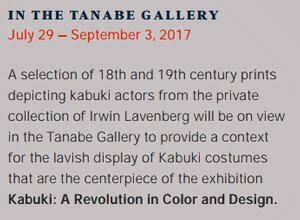 The print in this exhibition are from the private collection of Irwin Lavenberg. They illustrate the vibrant style of ukiyo-e, pictures of the floating world, which brought colorful images of the stage and demimonde into the hands of an eager public with the rise of Japan's urban culture in the 17th century. Unlike fine art, woodblock printmaking was a commercial enterprise. Publishers, who were the businessmen behind the production process, rushed to sell print of the latest theatrical sensation to eager kabuki fans. It was the publishers who commissioned artists to design the graphics, which workshops of carvers chiseled into planks of cherry wood, a different one for each color. become Tokyo, when Japan was modernizing rapidly. New technology introduced from the West meant the introduction of brilliant colors derived from synthetic dyes that smacked of evolving times. Even so, traditions in kabuki print design remained: details masterfully rendered; cartouches giving the actor's name and role; the action unfolding across multiple sheets of paper. Historical epics, famous romances, thrilling tales of the occult, and swashbuckling heroes kept the theaters booming and kept the woodblock print industry thriving. The success of kabuki is inexorably linked to its portrayal in prints, one lending intensity to the other and delivering to viewers even now the dynamic jolt of stories powerfully told. Courtesy of The Lavenberg Collection of Japanese Prints. Many thanks to Irwin Lavenberg and print specialist, Lynn Katsumoto. For profiles of the actors please see the article The Kabuki Actor. The Play "Imoseyama Onna Teikin"
Sources: Kabuki 21 website http://www.kabuki21.com/iot.php and as footnoted. The play Imoseyama Onna Teikin, by Chikamatsu Hanji [1725-1783] and others, was originally written for the puppet theater (bunraku) and staged for the first time in January 1771 in Osaka at Takeda Shinmatsu's theater. It was quickly adapted to Kabuki and staged in Kyoto in March 1771 at the Kitagawa no Shibai and was first performed in Edo in 1778. The Yoshinogawa scene pictured in this print is a Romeo and Juliet-type story about the lovers Koganosuke and Hinadori, the handsome son of Daihanji no Kiyozumi and the beautiful daughter of the widow Sadaka, whose parents have been feuding over the boundary between their territories. The stage set is both unique and gorgeous. It is the only kabuki play in which two hanamichi runways are used. Each one leads to the main stage, which has a river flowing down the center, flanked by cherry trees in full bloom. On either side of the river are the houses of the two clans. To the left is the home of the widow Sadaka and her daughter Hinadori, in which the walls are painted cream, the doors gold, and a vivid red Dolls' Festival display dominates the living room. To the right is the mansion of Daihanji and his son Koganosuke. Here the walls are a rich brown, and silver screens adorn the main room. Cherry blossoms hang from above the stage and are painted on the wings of the set, creating a frame of pink around the stage. As the scene opens, the two young people are in their respective homes: Koganosuke is reading Buddhist scriptures alone in his father's house at the foot of Mount Seyama in Kii Province (Wakayama Prefecture), Hinadori is celebrating the Doll Festival with her attendants in her mother's house at the foot of Mount Imoyama in Yamato Province. They are pining for each other, but are separated by the Yoshino River painted in bright blue and white, which appears to be flowing out from the back of the stage toward the audience by the use of a stage device called takiguruma (waterfall wheels). Daihanji and Sadaka appear on stage and greet each other courteously. The pair are suspected by Iruka of hiding Lady Uneme, the emperor's consort, whom Iruka wants to marry because she is the daughter of his political enemy Kamatari. Daihanji has been pondering having Koganosuke commit seppuku in order to avert Iruka's suspicion, as the young man helped Lady Uneme go into hiding. Sadaka, ordered by Iruka to give him her daughter Hinadori to be his mistress, has considered killing Hinadori and presenting her head to Iruka. When Sadaka hears that Hinadori would indeed prefer to die rather than go to Iruka, she beheads her daughter with a single stroke and sends the severed head, in a miniature palanquin, across the river to be united with Koganosuke, who has just stabbed himself. Seeing his dying son cradle Hinadori's head, Daihanji administers him the final, decapitating blow. 1 Heroes of the Kabuki Stage: An Introduction to the World of Kabuki with Retellings of Famous Plays, illustrated by Woodblock Prints, Arendie Herwig and Henk J. Herwig, Hotei Publishing, 2004, p.231. Copyright 1998-2008, Global Performing Arts Consortium. All Rights Reserved.